Taking to social media to document her dates with the unidentified man, the ‘Jersey Shore’ star shares a video of them enjoying what appears to be a lunch date on a terrace overlooking a marina. It looks like Jenni “JWoww” Farley is no longer single after her bitter split from estranged husband Roger Mathews. Over the weekend, the “Jersey Shore” star enjoyed several dates with a mystery man and documented it on Instagram Stories. She started it off on Friday, April 12, when she took to the photo-sharing platform to share a video of her enjoying what appeared to be a lunch date with the man. She was seen in the clip holding a glass of red wine as a few tasty looking meals were placed in front of her. “Cheers to the weekend,” she captioned the video which was taken on a terrace overlooking a marina. Even though her followers didn’t get to see how the man looks like, his hand was seen in the clip holding a glass of their own. 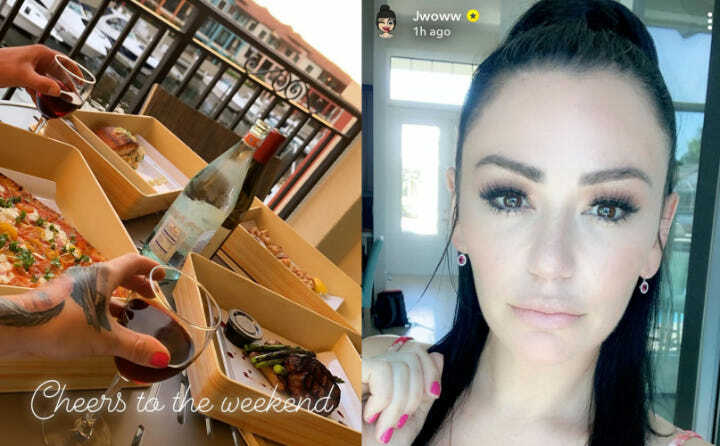 While JWoww was spending her weekend going out with the unidentified man, Roger enjoyed his weekend with their children, Meilani and Greyson. He shared on Instagram several videos and photos of him attending a birthday party at an arcade. “Thanks Jackson for having us at your birthday party. We had a great time!” he wrote in the caption.